BOSTON - Wednesday, May 2, 2018 - Mayor Martin J. Walsh today filed a notice of intent for the rebuilding of Long Island bridge with the Boston Conservation Commission, taking another step forward in Boston's plans to create a long-term recovery campus on the island. This filing builds on the Walsh Administration's commitment to ensuring every person who needs access to recovery services has the resources they need. "For many people, including myself, Long Island played a vital role in Boston's recovery landscape -- and it will again," said Mayor Walsh. "Tackling the opioid crisis means using each and every tool we have, and this is an important next step to ensure Long Island can serve as a resource for those in Boston, and those from surrounding areas, who are struggling with substance use disorders." "Boston is a healthcare hub, with state-of-the-art hospitals and addiction treatment facilities that draw people in need from across the state to seek care and access a path to recovery," said Marty Martinez, Chief of Health and Human Services. "We are proud to offer these inroads to care, regardless of a client's origins, and we look forward to building out Long Island to further support all of the most vulnerable who come to us seeking help and support." The notice of intent filed today specifies the method by which the bridge will be rebuilt. Closed on an emergency basis in 2014 for public safety reasons, the superstructure of the bridge was removed in 2015 with the support of all relevant federal, state, and local permitting agencies. Since the emergency closing of the bridge, all 742 shelter beds and all 225 recovery beds from Long Island were replaced, with additional capacity for both the homeless and recovery communities. In his January 2018 inauguration, Mayor Walsh pledged to rebuild the bridge, and create a comprehensive, long-term recovery campus on the island. While the island previously also served the homeless, homeless services will not be returning to the island. Read this message from Mayor Walsh on how the City of Boston is working to house the homeless through Boston's Way Home. Through Boston's recently released capital plan, Boston will invest $80 million in new funding to rebuild the bridge to Long Island, for a total of $92 million to go towards the project. In order to minimize impacts on the seafloor around the bridge, the bridge replacement superstructure component will be assembled offsite and then floated into place on barges. The new bridge will be similar to the original 1951 bridge, with one lane in each direction and sidewalks, as well as an open channel for boats below. The design and materials from the original bridge will be updated to ensure a longer-lasting structure that will be able to serve those in recovery for decades to come. "Boston is a national leader in recovery services. This bridge represents Boston's ongoing commitment to those who are struggling with substance use disorders," said Jen Tracey, Director of Boston's Office of Recovery Services. "As the opioid epidemic continues nationally, we are approaching it from all angles in Boston, taking bold steps and working with partners in the community to create a continuum of care and resources for those in every stage of recovery. 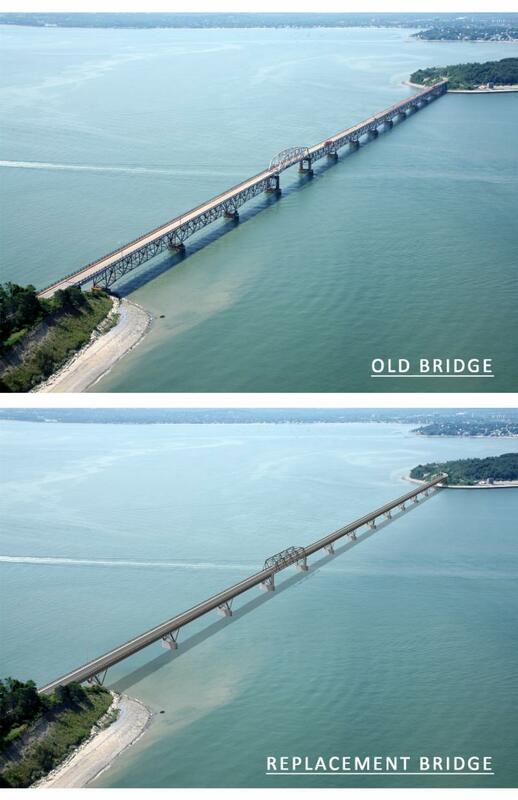 Having bridge access to Long Island will allow us space to create a long-term recovery campus that will fill the existing gaps we're identifying." The rebuilding of Long Island bridge and Mayor Walsh's commitment to creating a recovery campus, which will serve individuals in and around Boston who need access to recovery services, highlights the Walsh Administration's work in tackling the national opioid crisis, and its effects on Boston and surrounding towns. "Mayor Walsh's essential budget priority to invest rebuilding Boston's Long Island bridge and siting a recovery campus for our city's most vulnerable seeking treatment could not happen quickly enough," said Founder and President/CEO of Victory Programs Inc, Jonathan D. Scott. "Historically for the last 150 years Boston's Long Island has been specifically used for this kind of fundamental healthcare initiative, especially for our poorest and most disenfranchised. With a new bridge and a recovery campus, Mayor Walsh is ensuring new hope against the complex crisis of addiction, and suitable, necessary and best purpose for the city owned Harbor Island." "Having Long Island available for quality services will help build a bridge of hope for the too many people in need of addiction treatment and recover," said Massachusetts Organization for Addiction Recovery Executive Director, Maryanne Frangules. In 2015, Mayor Walsh created the Office of Recovery Services to study substance use in Boston and lead the city's strategy around substance use disorders and recovery. This is the first and only municipal recovery office in the nation. In 2016, Mayor Walsh launched the new 311 for Recovery Services 24/7 hotline support system to help people struggling with addiction to access all levels of recovery services. The Office of Recovery Services (ORS) has created innovative programs and taken steps to address substance use disorders. These include the Personal Advancement for Individuals in Recovery Initiative (PAIR), which offers a scholarship program for low-income individuals in early recovery to spend on college or training courses. In addition, the office has expanded the City's access to care program, PAATHS, with additional staff members and extended operating hours to ensure around the clock access to detoxification, residential programs, medication-assisted treatment, and support for caregivers. The City of Boston has also invested in outreach workers to bring recovery service interventions to the intersection of Massachusetts Avenue and Melnea Cass Boulevard. The outreach workers are equipped with naloxone (Narcan) and have the ability to connect people with the appropriate recovery services and supports. Together with the ORS, Boston has created a daytime engagement center for homeless individuals that hosts programming and access to medical, recovery, housing and job search services. The street outreach workers guide people to the center, which sees more than 300 visits a day. The engagement center, which began as a pilot, was permanently funded in Boston's fiscal year 2019 budget due to its success. In his first weeks in office, Mayor Walsh mandated the life-saving medication naloxone be carried in every public safety vehicle in the city. Police, firefighters, and EMTs are using this tool to save lives on a daily basis. In addition, the city provides ongoing overdose prevention and intervention training for family members, community members, private businesses, and city employees, training more than 10,000 people a year. Mayor Walsh serves as the Chair of the National Task Force on Substance Use, Prevention and Recovery Services for the U.S. Conference of Mayors, guiding mayors around the country in innovative approaches to the addiction crisis. The rebuilding of the Long Island bridge, and building a recovery campus, will further the Walsh Administration's commitment to creating resources and services for all those who are in need. The next steps in the rebuilding of Long Island bridge include filing a notice of intent with the Quincy Conservation Commission. Construction on the bridge replacement is expected to begin in 2019.